At The ART of Communications, an independent writing, advertising, and communications agency, the focus is on you: Your goals, your messages, your audiences, your budget, and your success. The AOC mission is to develop and deliver fresh, innovative solutions that will target your markets with the most creative programs--on time and with reasonable rates. To effectively convey your message, you want vibrant, yet accessible text. And you want words and imagery that integrate seamlessly. The ART of Communications will use "the write touch" to craft copy that speaks your language and tunes into your audience. With an extensive background in creative communications and consulting, principal Arthur Levine offers the perfect complement of hands-on experience, vision, and expertise to coordinate your projects and programs. Unlike large agencies, which assign projects to junior staff, every client receives Levine’s personal, careful attention. Specializing in copywriting, desktop publishing, electronic media, and editorial writing, Levine also directs and collaborates with a network of creative professionals to offer a full complement of high quality creative services. A travel writer with a passion for the amusement industry, Levine has been the online Theme Parks “Guide” at About.com since 2002. Geared to consumers, the highly popular site offers features, park profiles, ride reviews, and other content to help users plan their vacations and day trips to parks. Reporters and producers frequently seek Levine’s expertise and opinions about the industry, and he has been cited in many national publications as well as been a guest on numerous radio shows. He was even mentioned on the series finale of the "Gilmore Girls." 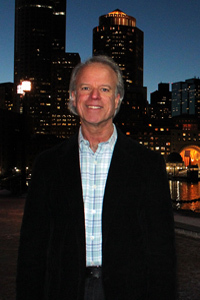 columnist and freelance writer, his articles have appeared in the Denver Post, the Boston Herald, the Columbus Dispatch, the Atlantic City Press, the Providence Journal, the New Hampshire Sunday News, Consumers Digest, and other publications. A musician, Levine plays electric bass guitar in rock and jazz bands. That's the Gardner Street Band, with Levine on bass, playing during the intro to this Web site.